Given that I write and comment about strategies and communication styles within the vegan/animal rights movement, people often ask me about my views on certain tactics and approaches. One of the questions I get most often is what my view is on the “Cube of Truth” street actions by the group Anonymous for the voiceless. In this post I’ll briefly share some some thoughts on this particular form of action. 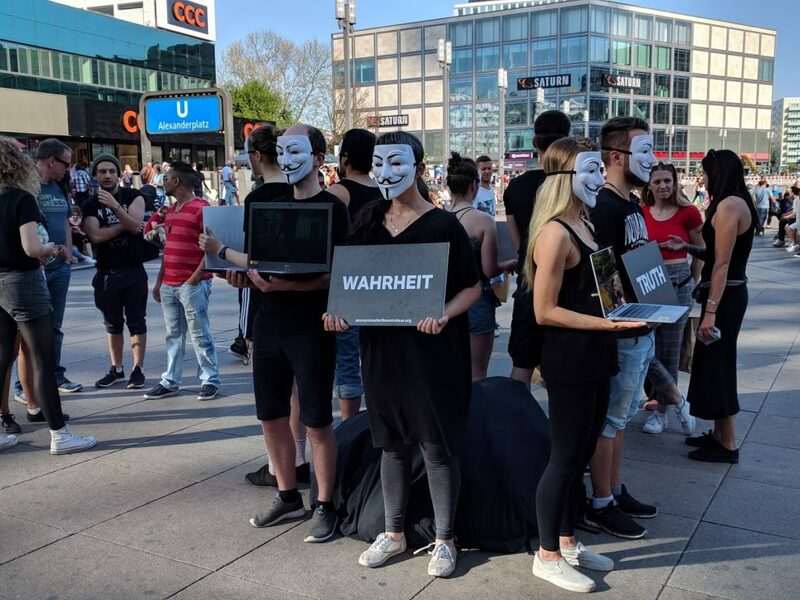 To help form my opinion, I attended one cube of truth in Berlin, somewhere in Spring of this year (2018). I didn’t actively participate, but was there as an observer. My thoughts and impressions are mainly based on this one instance, and also on my impressions of online videos, and feedback by other vegans. This still gives a very incomplete picture, so I’ll consider my opinion as preliminary. Judging from what I hear, while the structure of the Cube of Truth is always more or less the same, the way passers-by are approached and talked to seems to differ much among cubes or groups. For those who are not familiar with the concept: a certain number of activists are standing in a busy area. They are arranged in a square, all facing outwards. They hold signs (displaying messages like “truth” or “watch to see why we are here”) and laptops showing graphic images of animal cruelty. They wear Guy Fawkes masks. Passers-by who stop to watch the footage will be addressed by other activists, who are not in the Cube, but who are outreachers. These activists will ask the onlookers what they think of the images, inform them further, and try to get a commitment to change (see below). This concept has become very popular, and has spread all over the world since its conceptualization in April 2016 by Paul Bashir and Asal Alamdari in Australia. Together with DXE and the Save Movement, the Cube/Anonymous represent today’s most popular street actions. At the moment of writing, there have been 4000 demonstrations in 650 cities worldwide, allegedly convincing 215.000 bystanders to take veganism seriously. My impressions of the one Cube I attended in Berlin were largely positive. I was rather impressed with how I heard the outreachers talk to the onlookers. Most were not pushy. They were asking questions and listening, rather than just blurting out all the facts and numbers on animal suffering they had. I was told that outreachers only approach people who have been watching for a while, and will not bother with those who just walk by and seem not to be open for any conversation. Outreachers seem to ask people to go vegan or to try Challenge 22 (a vegan challenge of 22 days). From what I read and hear, there’s no desire to ask for “steps” or reduction, possibly because this is not considered an ethical ask (I’ll get back to this). I did one little test with a couple of onlookers who had been addressed by an outreacher and asked them about their experience of the conversation. They answered that it had been positive. They were not ready to go vegan, but they had definitely received food for thought. I’m not sure whether this couple was checked as a success (“will take veganism seriously”) or not by the outreachers. I can definitely see some very positive aspects to this kind of activism. First of all, it seems to be very successful in attracting new activists. It’s easy to imagine that standing there, trying to reach people, together with other activists, gives one a satisfying feeling – a feeling of actually contributing to the movement and helping animals. No matter how big the actual impact is, this is valuable in itself. The movement needs as many active people as possible (something I consider more important than being “very very vegan”). I can see that many of these people could transition to other kinds of activism (which would be especially important if some day we’d conclude that this form of activism is not sufficiently effective – a conclusion I’m not able to make at this moment). It’s easy to see that this form of joint activism is more attractive to many vegans than just standing in the street (with leaflets or a sign) by oneself, and that doing things in group provides a sense of community and mutual support (after a Cube, activists often get together for a meal or a drink). There are concerns about the masks as well. Some people I talked to seem to find them off putting. I do understand the purpose of using masks in general: they make it clear to people who are walking by from afar that something is going on there, and this could motivate them to come closer and check things out. Of course, if they find the masks scary, or too alternative looking, they might not. A second purpose of the masks is that a person with a mask looks more like a kind of statue, and that may make it easier for people to come closer and to watch the computer screens for a while. One doesn’t feel one is being watched. Of course, you could ask the question why the laptops aren’t just put on some kind of stand, without any people having to carry them. Presumably that might take away from the visual spectacle. As to this particular mask: I’m less sure of the choice. I don’t think many people know or care about the symbolism behind it. And if it would be a bit scary to a sufficient percentage of onlookers, it might be interesting to think about other masks. The day of the demo was bright and sunny, and that meant that it was hard to see the computer screens. To me, that seemed kind of an advantage. Showing graphic images to unsuspicious onlookers is probably the most controversial part of this form of activism. It’s especially concerning when there are children among the audience. Seeing very graphic images may trigger or traumatize some people. Keep in mind that people have not given their consent and have not been warned about what they are going to see. They just approach the screens, not knowing what to expect, and may suddenly find themselves staring – with their small children – at blood and gore. This is not to say I believe that negative footage should never be shown. But there is a difference between very bloody and gory footage (animals’ throats being cut in slaughterhouses for instance) and other images that may also very well pull heartstrings, but are not as shocking. Apparently images from this latter category are also used – like this video of a mother cow running after her calves that are being taken away… Stuff like this is not traumatizing or gory, but could very well stay on one’s mind for a long time (subtitles could be added to make more clear what is happening). I wonder to what extent tests and polls are being done in general, and to what extent Anonymous is confident about results and impact. It seems that as a metric they use the number of “conversions”. Outreachers check a conversion when a person verbally commits to one of three things: 1. Going vegan. 2. Doing the vegan22 challenge. 3. Watching one or some of the vegan documentaries with the intention of learning more about veganism. Outreachers are generally asked to be conservative in their decisions as to whether or not to count an interaction as successful. Obviously the impact has a lot to do with how many people-hours go into to an action like this, versus how many people are actually being reached. If you stand there for three hours and only reach a dozen people, it seems not the best use of one’s time. I don’t have an idea of the average number of people reached though, and I guess one event will inevitably be better and bigger than another. Like I wrote at the beginning, my impression is based on limited experience and information. 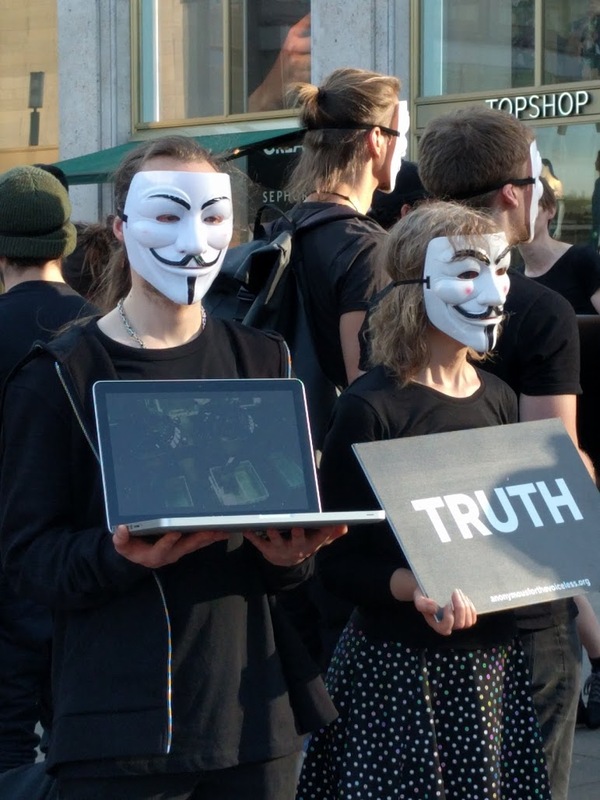 But from what I can see, if you want to do one-to-one outreach (rather than more institutional outreach) and if you want to talk about moral arguments (rather than health, or rather than working with food), then Anonymous and their Cube of truth seem to offer an appealing way of doing activism for many vegans. Put sufficient efforts in training people in good communication skills. I’ve learned that Anonymous is launching a global online education initiative called “AV Academy”. If at all possible, consider using food. I’m a big believer in food outreach. I realize handing out food makes the logistics a lot heavier, but it would contribute to a friendlier image and combine the head and the stomach. Maybe handing out coupons for nearby vegan restaurants could be interesting. I may update this article in the future when I get new insights or information. Hi , an interesting outlook.There are many forms of activism and many people who do AV do other forms of activism. A number may just stick to AV. The sole objective of AV is of a obolishionist stance. So we practice this form of activism due to this. There is just as many reviews on to the real effectiveness of leaflets and of food. These can be more geared toward animal welfare, health and environmental issues. While we do discuss the health and environmental aspects are aim is that of abolitionism. I have been involved in many cubes and have found this more efficient to my form of activism. We all have our views but it is that AV is consistent or should be ,wherever you go around the world. It is organised and professional. It is also incorporated as activism as an aesthetic Street art form .The masks are integral to this. I feel this would be lost wearing tame masks. Besides other organisations use othe masks? Of all masks available the Guy Fawkes masks have a meaning and association? What would be effective ,Marvel mask of Freddy Kruger mask?Both are at the end of mask spectrums? I do not think these would have any credibility? As to food being given away at activism I am unsure as to how effective this is? Many people will try food but mainly to try. I have known vegan food cafes who not only attract vegans but a third have been vegetarians and a third meat eaters trying something different. This may forward the vegan message but may do little to promote people giving up animal products. This may well sow he seed, but telling how it really is could be even more effective. With AV wherever you go or travel around the world you can participate. You may not speak the language or have local knowledge of food use, local health and environmental issues.But you can wear black , a mask , hold a laptop stand in a cube and this feels affectively part of a global activist family. Do what you feel is comfortable for you? AV may not be for everyone, but neither are leaflets and giving out food samples? They may all have a place. Even as vegans we will all have our differences! This kind of street activism launched in the UK, London by two sisters Phoebe & Jane Frampton. It is called The Earthlings Experience. They wear neutral white masks and stand in a circle or in a straight line. I read this bc i was curious how the anonymous group feels about their masks being hijacked for AR. Not that i have a problem w that, but i was wondering if anything like that is the case and how they feel about it. To my disappointed that wasnt discussed. Second, I would really like for you to do a discussion of AR taking over the International Logic Party to more effectively organize itself politically and to gain respect from all people by giving humanity an intelligent democratic system. Due to the fact that doing outreach AV style fulfills my need to conteibue to the world through education, I’d like to give some feedback on your article, even though it is biased. Twelve people in 3 hours means 1 person each 15 minutes without any brake. I would be happy with this number. From my experience (about 10 outreach events), 15 minutes is a short time for a bystander or a group to want to watch a documentary or consider veganism. Or maybe it s just my poor influence or communication skills. Some people are indeed disgusted and walk away immediatly as they see explicit scenes where live beigs are murdered, and if it is a couple, one of them is dragging the other enev if (s)he (one person from the couple) is interested in wathing furter, (s)he gets dragged away. Usually it’s the masculine side of the couple :-D.
OTOH some of them stay there in shock and horror and a bit later they have conversations with outreachers. So it’s a tool which can go either ways: efficient or inefficient. IMO it depends on a lot of other factors the way they react. A big thumbs up for “Puttig sufficient efforts in training people in good communication skills” ! Wducation is the core of our evolution as beings here on Earth. I hear about AV Academy here for the first time and I’d be the first one interested in attendig and even makeing it happen here in my country. Thanks for the idea of handling coupons of vegan restaurants. Good evaluation and suggestions for the Anonymous for the Voiceless demonstrations. I’ve recently discovered Cubes of Truth and I’m glad that you’re broaching the subject. A bit of context to my comment so that you understand where I’m coming from : I’m interested in veganism/antispeciesism as a social phenomenon but I’m not a vegan/antispeciesist myself. – Associating “Truth” signs to the display of photos and videos : truth is not a set of photos or videos displayed without critical analysis. I mean, what truth statements can we derive from these videos and photos? That industrial cattle raising is awful, at least in some cases? Are all the situations depicted in these photos/videos really implying suffering or is it a projection due to anthropomorphism or insufficient context information (cf. next point)? I find this association doubly fallacious (and cynical) in the sense that the intent is not to achieve truth but rather to spark an emotional reaction in the viewer. – I want to mention the video of the cow that you would prefer to be shown : it’s interesting to note that this video was published by the New York Post* with emotional music, guilt-tripping subtitles (“this footage will ruin your next glass of milk”) and a fallacious legend (“Heartbreaking video shows a desperate cow chasing after her calves on their way to slaughter ?” while they are most likely being moved to a different place and not necessarily separated at that moment in time). This just illustrates that a video is no “Truth” in itself and that having a critical outlook on things and access to context information is essential. As you say, “subtitles could be added to make more clear what is happening”. True ones, that is. – I find appeals to emotions as a way to convince people immoral, because, to me, it amounts to a kind of manipulation. I believe that rational argumentation should be preferred, with the risk, of course, that people may not be convinced. I’m aware that we’re far from being entirely rational (fortunately so) and I don’t condemn emotions as such. The reasonable use of emotions in activism can be debated but in this case, Cubes of Truth are really off limits : the whole set-up intends to shock and the solution that is promoted is that going 100% vegan is the only option. – I looked at the video of onlookers’ reactions and visited Anonymous for the Voiceless Facebook page, where you can see one photo of a man crying. I also saw the video of a man pledging to go vegan at one of these events. Am I the only one to find that this method looks very much like (Christian) soul winning sessions? Doesn’t this similarity raise questions? – the use of Anonymous masks is also interesting because I think it is revealing of the standpoint of these activists : they are aware while the rest of the world lies in darkness. However, unlike Anonymous activists, the images they show are generally not the result of their own work and they don’t risk anything in showing them. So, I find the reappropriation dubious. What strikes me most about the vegan movement is that wearing black cloths becomes the standard. This type of clothing is too far from mainstream. …. at the end there could be the black vegans on the one side and the mainstream majority on the other. It doesn’t make any sense too me. Hey Tobias! It’s a bit late commenting on this post, several months later, but I wanted to hold off on giving my personal point of view before actively having participated with the group myself. I don’t agree with several points Marie gave above, mainly the one that we shouldn’t appeal to emotions when making ethical decisions because this would be ‘manipulative’. If you have a look at what is more effective in ‘moving’ people towards a more moral lifestyle, rational arguments dangle at the very bottom. As a matter of fact, I try to steer away from argumentative conversations as much as possible during outreach, exactly because it only gives into the cognitive dissonance and the dozens of (often fallacious) arguments people use to justify their consumption of animal products. The images used are meant as nothing more than that: enticing, thought-provoking, and making people stop in their tracks. That’s difficult as it is, and anything that would be less graphic would be far less effective in generating the interest of people mainly focussed on shopping on a Saturday afternoon. This is as well why the ‘truth’ of the videos is not at stake here; no-one goes into the details of where and when this happens, nor the specifics of the how, yet simply the why. (If any information is given, it should indeed be correct; that should go without saying.) That’s the ‘truth’ the groups aspires to obtain and make people see, assigning anything else to it would be wholly missing the point of the usage of images. If anyone is touched by the images, then this simply means they feel empathic towards those who suffer. I’ve come to distrust people who remain completely unphased by these graphic images; they’ve either been desensitised, or have a limited functionality of their VMPFC. Then again, I DO speak from an anti-speciesist mindset and from the perspective of a moral philosopher and vegan activist; my goals is to have people act on their empathy and take into account animal suffering. The group I’m participating with is the one in Barcelona. It is interesting to be in Portal de l’Àngel again, one of the main shopping streets with plenty of people on Saturdays, exactly because I was there coordinating a group to do the exact same type of outreach ten years ago. Twice a week we lined up between ten and twenty activists holding placards and laptops with graphic images, giving out leaflets and talking to people. In fact, some of the videos used by AV are the same or came fro investigations by that very organisation (Animal Equality; they make this very clear on the AV website as well). Back then, we did not use masks, nor had any uniform way of dressing, and it does make me uncomfortable wearing the Fawkes mask as I don’t fully under scribe the ideals put forth by the Anonymous movement, nor do I want people to think that in order to become vegan, so should they. Politicising vegan activism seems a roadblock, so neutral masks could indeed be helpful. Yet, after having stood there six times now, no one has ever mentioned the masks, nor seems distracted by them. A decade later I still vividly remember how emotionally upsetting it sometimes was to have people directly look at you, instead of the images; the mask gives some space to me, as an activist, not having to be necessarily involved in anything more than a purely physical way. I’d happily trade an uncomfortable for the extra confrontation of, at times, feeling exposed. That is, until someone takes over the laptop or sign and I can talk to people, in a respectful manner. So I wouldn’t discard the masks or black clothing completely, the anonymity of it all works well for spectators and activists, and takes away much of the protagonism. Oh, if I may add one more thing: everyone halting and looking on does so on a completely voluntarily basis. Plenty, if not most people look away and walk on. Diversifying our activism can reach all layers of the population and all personality traits, this is just one of the many positive ways. Can somebody explain the symbolism of the mask? I agree that this is a great way of educating about the truth of animal exploitation but I find the mask very intimidating . If i am going to approach someone then I want to be able to see their face. They really should get rid of the masks.